Q: My product has multiple sellers. How can I link to mine only? A: The Merchant ID is used when there are multiple sellers for a product and you want to make sure that shoppers go to the correct link to buy. Once setup correctly, adding the Merchant ID to your Super URL link will always show you in the Buy Box. Select "Settings > Account Info" from the menu. Inside of the Seller Account Information, click on 'Your Seller Profile'. In the Seller Information section there should be a URL for the Storefront Link. Copy and paste the URL into your browser to go to your storefront. You can then click into the web browser address bar displaying your URL. Enter just the ID (not the whole URL or other text) into the Merchant ID text box. 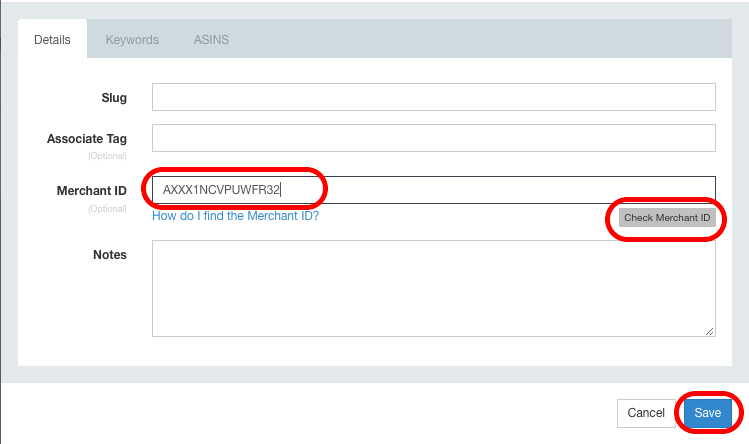 It should look similar to the image below when you have pasted the correct Merchant ID in the text box. Click on 'Check Merchant ID' to ensure it is linking correctly. Note: A wrong ID can show 'No Stock Available' in Amazon for your product. You would think Amazon would make this easier to find, huh?